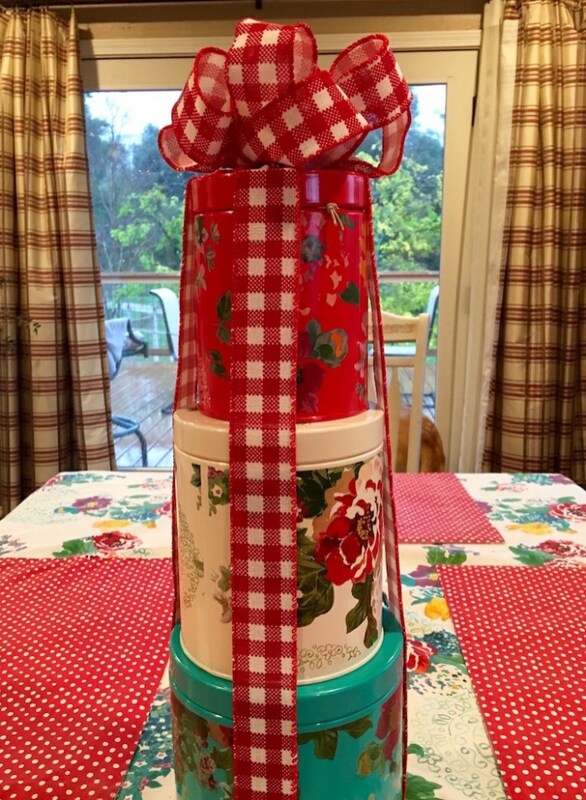 A canister set (by Pioneer Women) is so beautiful that no gift wrap could be better. Each of these canisters are filled with favorite treats, teas, coffees, cookies, or pretty much anything the recipient likes. This particular ribbon is 5 yards (a gift in itself). It has wire so it was easy enough to whip into shape with a couple of bow ties at the top, and a few loops tied in, or tie a simple bow with any ribbon or string. If your sick of the same old gift wrap, stick with us and we will add new gift wrapping ideas as we come up with them. 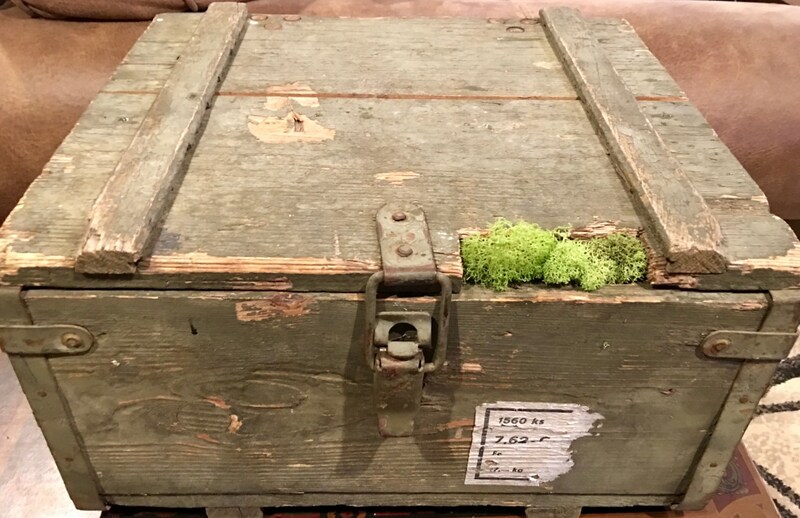 A very cool old Russian ammunition box from WWII. We found this old box in an antique store. Perfect for the gun collector receiving this gift. 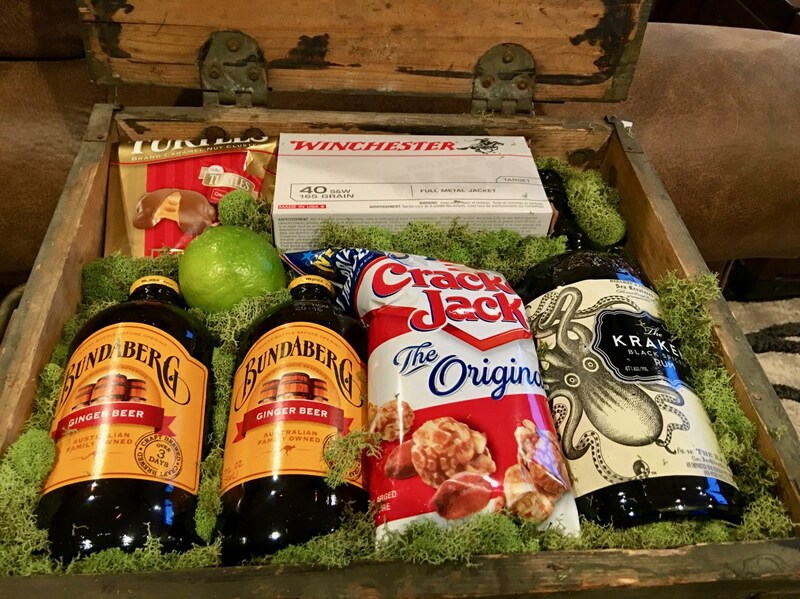 We filled it with moss, and all the makings for his favorite drink, plus a snack and a box of ammo. See whats inside! For 2017 we used last years paper, and diamonds from a previous DIY. For the bow we clipped off pieces of an old fake garland, and picked real berries from the yard. Used a hot glue gun to put it together. Rows of diamonds can be purchased for $4.00 to $10 at crafts stores. 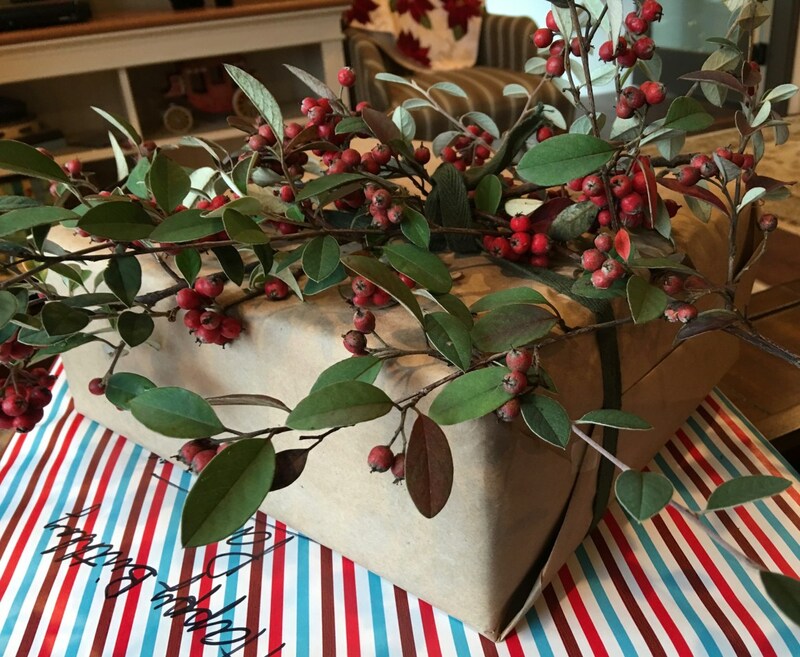 Gift wrapping ideas can be simple and sometimes even free. Do the same thing with any box that fits the personality of the person receiving it. Examples: An old sewing box or a new one filled with sewing tools and supplies (pins, scissors, patterns, etc) that a sewer never has enough of. Also consider canisters for a baker, filled with baking ingredients. No end to the types of boxes and contents that are far more unique and custom than anything you would find ready-made. 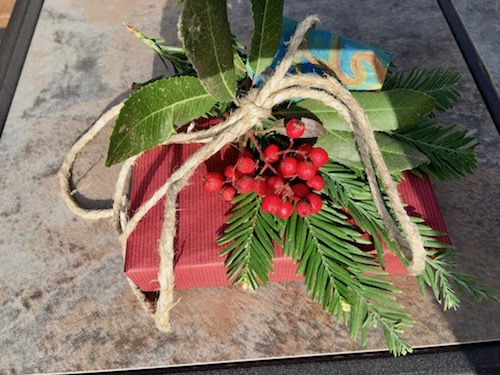 Photos above and below are all natural gift wrap and is truly the easiest most natural, and free. Wrap with a brown paper bag, newspaper, magazine pages, or whatever you have. Gather leaves, berries or whatever you can find around your yard or neighborhood. 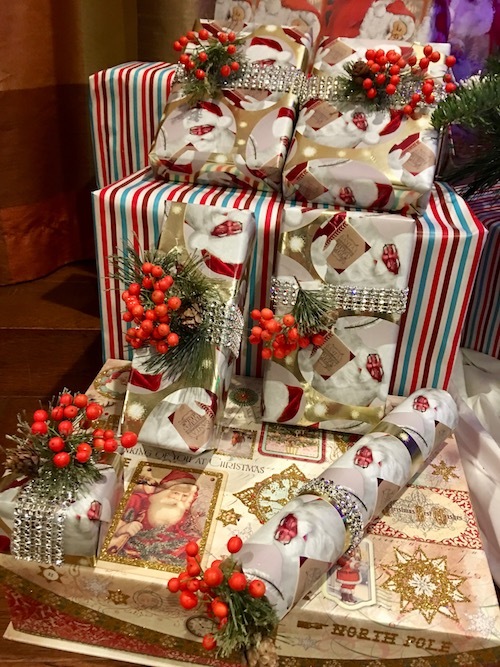 Tie it all up and you have a beautiful and festive unique gift wrap for anytime of year! 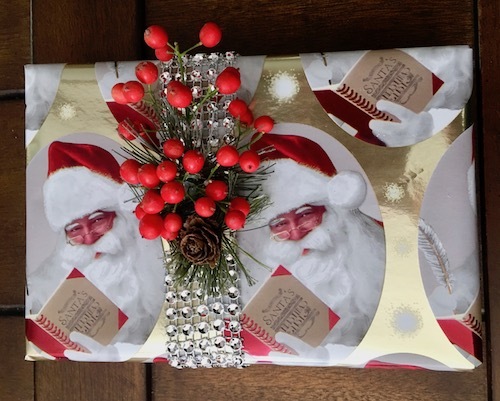 Sometimes the gift is too good to wrap, and here's one example. 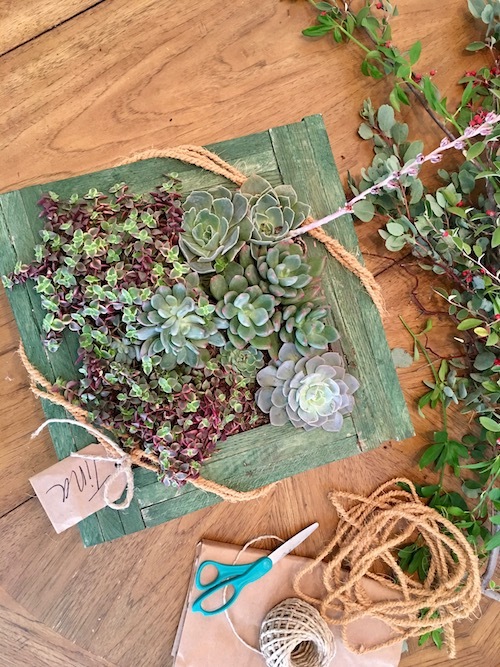 This beautiful succulent arrangement planted in a frame is perfect for a minimal wrap. Just string and a tag, and your done! ...and that's the DIY effect!